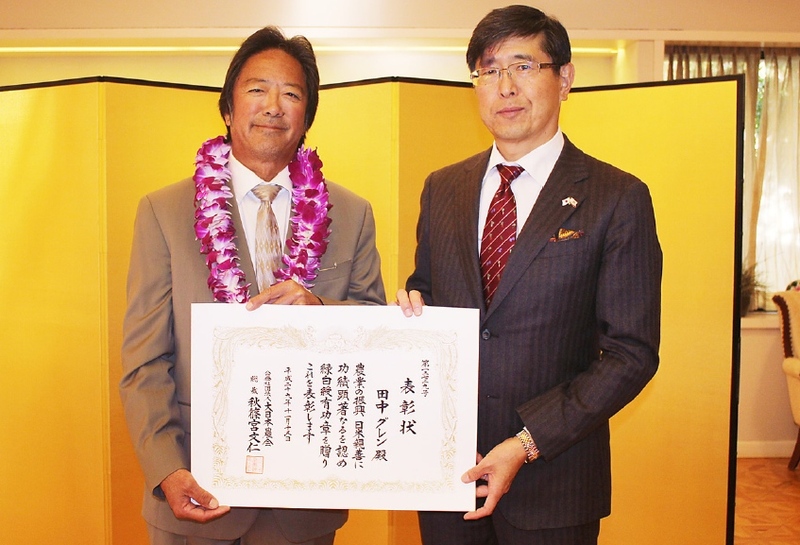 The Agricultural Society of Japan (Dai Nihon Nokai) awarded its Agricultural Achievement Medal for 2017 to Glenn Tanaka at a ceremony hosted by Consul General Akira Chiba on Nov. 30 at his official residence in Hancock Park. Born in 1957 in Huntington Beach, Tanaka graduated from California State Polytechnic University, Pomona, with a degree in agricultural business. He is the third-generation owner of Tanaka Farms in Irvine, which was founded by his grandfather, Teruo Tanaka, an immigrant from Hiroshima. Glenn Tanaka, his wife Shirley and his son Kenny operate a 30-acre farm that produces fruits and vegetables that supply its produce stand and provides for its CSA (Community Supported Agriculture) program and various educational tours. In 1998, Tanaka Farms decided to go to Responsible Farming Methods after land development forced it to move the farming operation from Irvine Center Drive and Bake Parkway. The farm is now situated in a valley in the heart of Irvine. Tanaka was recognized not only for producing high-quality, safe organic fruits and vegetables but also providing educational experiences to children and contributing to the community by organizing tours and events at Tanaka Farms. In addition, he is a board member and past president of Orange Coast Optimists. He has strongly supported donation activities for individuals and farms affected by the Great East Japan Earthquake, which struck the Tohoku region in March 2011. The commendation ceremony was attended by family members, friends and colleagues. The consul general congratulated Tanaka for his achievements and presented him with a certificate and a medal. Congratulatory remarks were delivered by Shinkichi Koyama, chairman of the Dai Nihon Nokai Southern California Council, and Kimiko Fujita, president of the Orange County Japanese American Association. Tanaka said that he was very honored to receive the award, but that it would not have been possible without the community’s support. He gave thanks to everyone present. Jeff Yamazaki, president of the Japanese Chamber of Commerce of Southern California, congratulated Tanaka and offered a toast, which concluded the ceremony. A reception followed. The Agricultural Society of Japan was established in 1881 for the development and improvement of Japanese agriculture, agricultural community, and farmers. 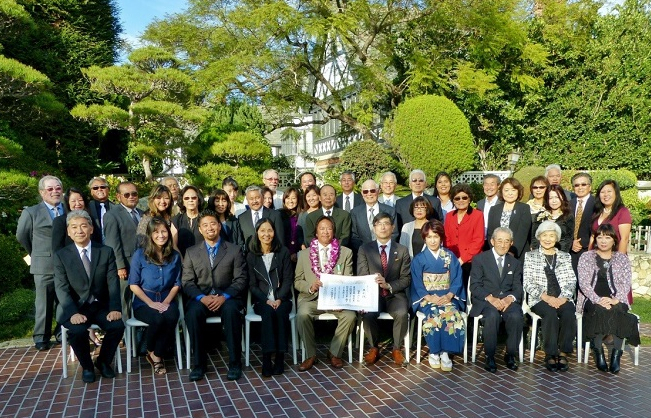 Glenn Tanaka was joined by family, friends and colleagues at the consul general’s official residence.